Summer is finally almost here and we can’t wait to spend some time on the beach. With kids out of school we’ve got you covered with lots of of fun summer crafts and activities to keep the kids busy! 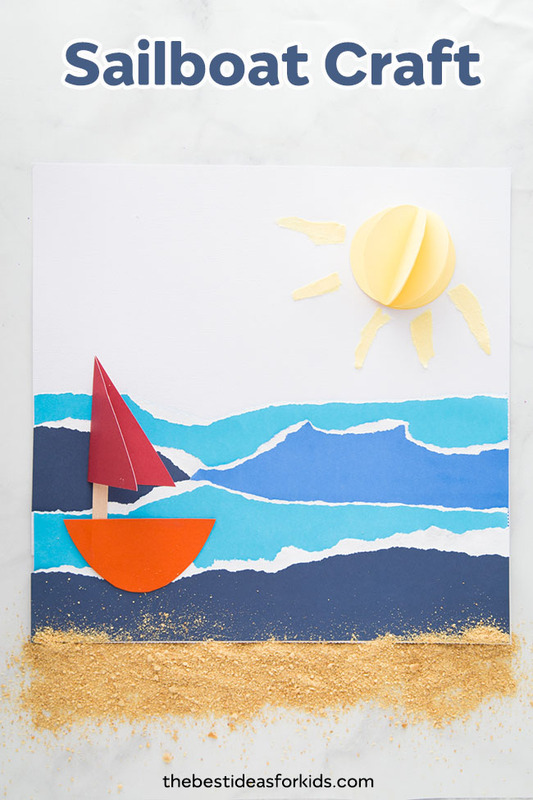 This summer sailboat craft is perfect for a rainy day inside. It’s also great to reuse some of those old paper scraps you may have lying around. 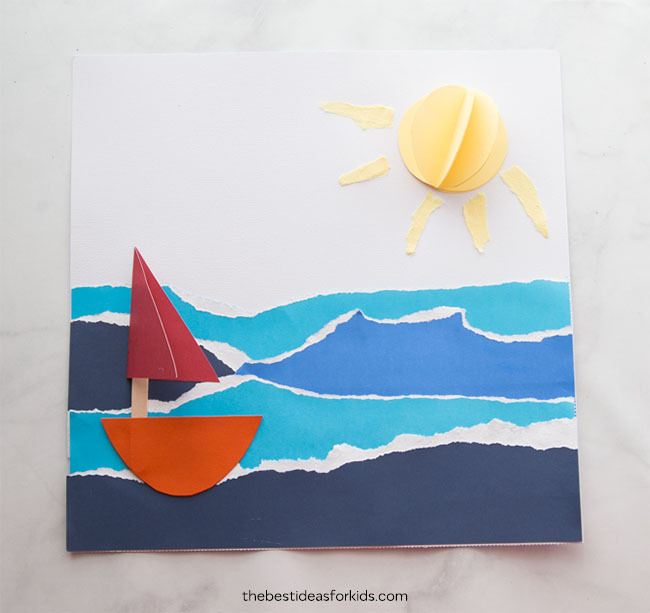 This easy sailboat and ocean craft for kids is really fun to put together! 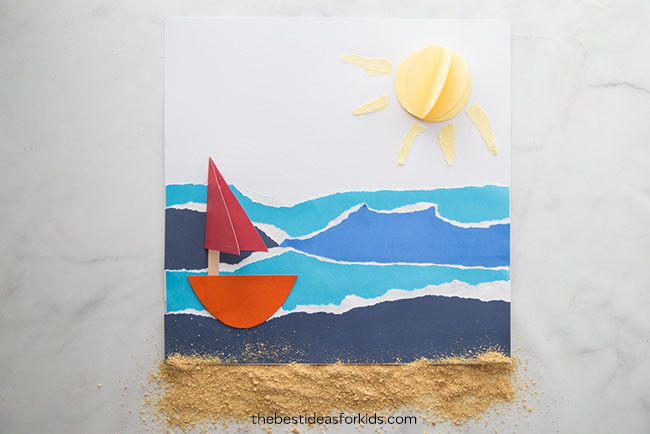 Kids can have fun creating their own sailboats and making the ocean out of paper strips. This would look great in a classroom too if every child created their own unique suns and boats. You could even make a large bulletin board version of this and add all of the paper boats to it! 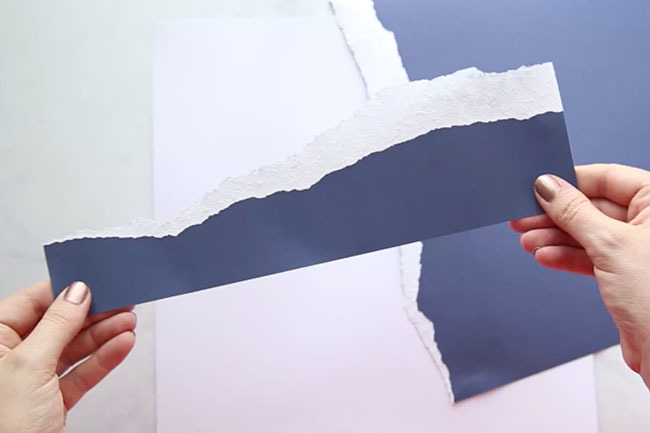 We dropped some make-believe sand at the bottom of the paper to make it look like sand but you could also glue this onto the paper yourself too! 1. First start by tearing your paper so that the white from the tear on the cardstock looks like it could be froth from the waves in the ocean. There is no right or wrong way to tear the paper. 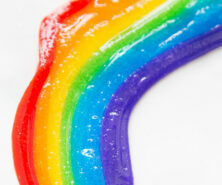 Just tear away and select some different colors to mix it up! 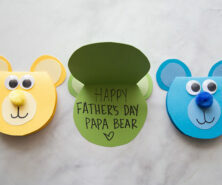 The best part about this is if you already have some paper scraps lying around you can reuse them for this part. Tip: If you want the paper strip to go along the whole part of your large white cardstock, you’ll need to get large blue cardstock too. 2. 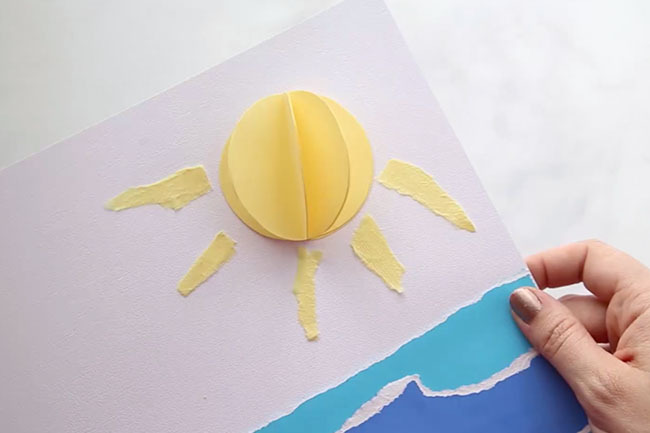 To make the sun, cut out 4 identical circles and glue them together. We used a circle puncher but you can also trace around anything round that you have like duct tape or a tin can. 3. Then rip some yellow cardstock to make the sun’s rays. 4. Now to make your sailboat! 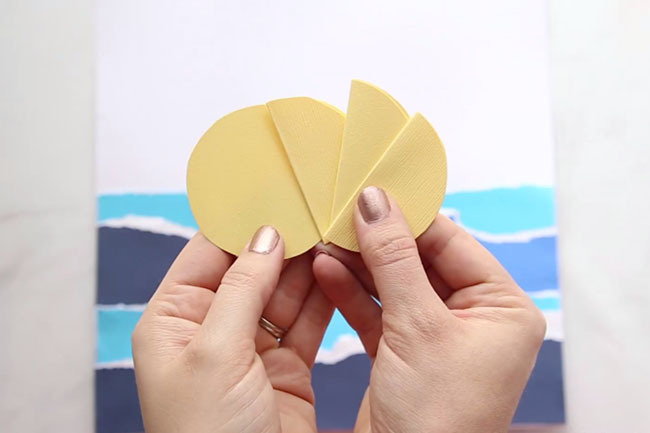 Trace the bottom of the sailboat on your orange cardstock and cut out two that are the same size. Glue one on top of your water. Fold a piece of your red paper and cut half of a triangle out. Glue half of the folded part down. Glue your popsicle stick inside the folded part of the sail. Now glue your second bottom of the sailboat on top to cover the popsicle stick. 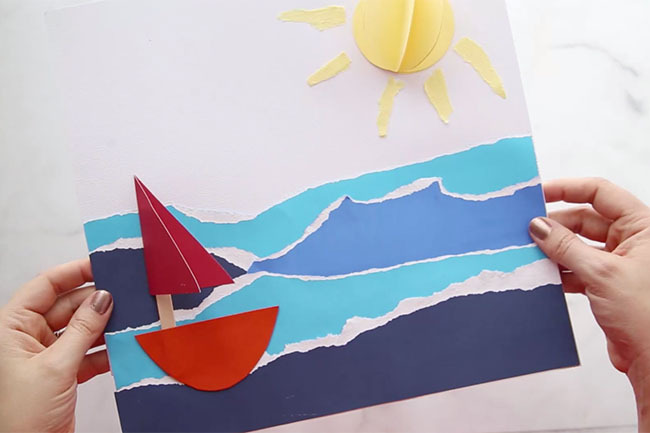 And that’s how you can make this simple and fun paper sailboat and ocean craft! 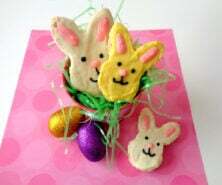 We’d love to see how yours turns out – please come to share your finished craft in our Facebook group. Want more fun summer ideas? – See our summer bucket list with over 100 ideas! We were inspired to make the 3D sun for this craft from a 3D sun made by Twitchetts. 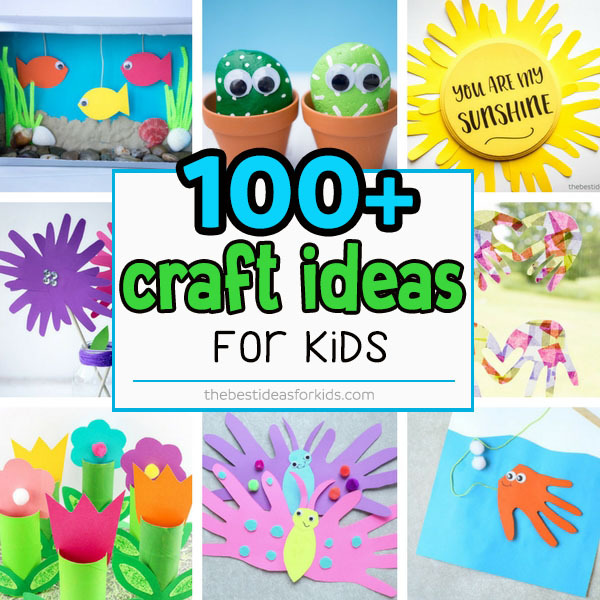 If you’re looking for more fun summer craft ideas, see our list of over 100+ craft ideas for kids.